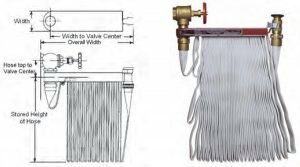 J & L offers a large selection of fire hose, equipment and valve cabinets, including steel, stainless steel and aluminum in many trim styles and optional features. 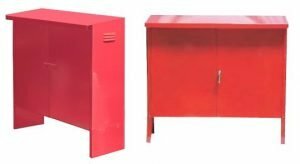 This durable Storage Cabinet has CRS Steel or Galvanized Steel Construction for Interior or Exterior Use. The top is angled with a 3″ overhang to shed water. Construction: 16 gauge galvanized or cold rolled steel construction. Both are finished with red powder-coat paint and features shelf and louvers on both sides of cabinet for ventilation. 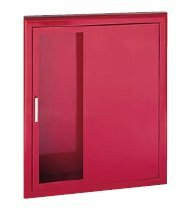 Top is slightly angled and overhangs the doors by 2-7/8″. Optional 12″H legs are CRS. Hardware: Hasp for a padlock (by others) standard. 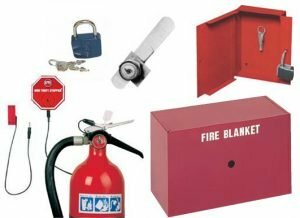 Operation: One-man operation for immediate means of fire control. 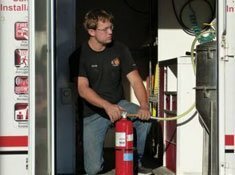 Ratings: 100 GPM at 65 PSI at the nozzle. 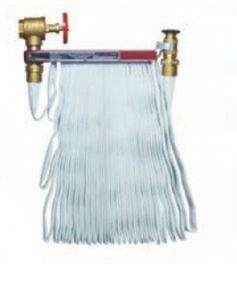 Hose is FM-approved, Industrial Fog Nozzle, Angle Valve and Pin Rack are UL-rated. 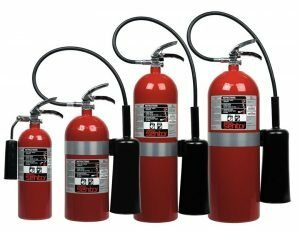 Models 3005-3110 rated for Class II Service under NFPA/FEMA Class of service. 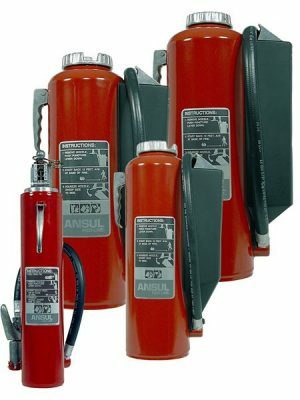 Models 3205-3212 rated for Class II and Class III Service under NFPA/FEMA Class of service. 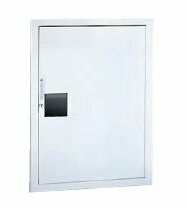 Door and Trim: #4 stainless steel, clear anodized aluminum or cold rolled steel with white powder-coat finish standard. 1 ¾” face trim on frame and 1 ¼” trim on door. 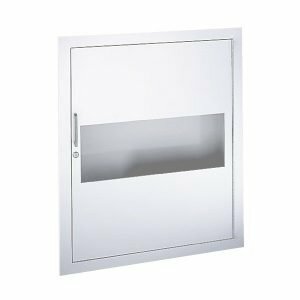 These flush cabinet doors are mounted in a 5/8″ door stop are attached by a continuous hinge and equipped with zinc-plated handle and roller catch for all non-break glazed doors. Trim Style and Depth: Trimless Recessed – for 5/8” depth drywall or 3/4” plaster. Recessed – 3/8” flat trim. 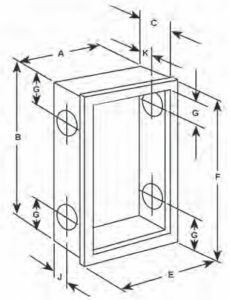 Semi-recessed 1 ¼” Square Edge or 2 ½” Rolled Edge. Rolled edge aluminum trim is formed of extrusions. Surface mount steel and aluminum have square edge, stainless models have rolled edge with galvanized back wall. Tub of steel and aluminum surface-mounted models are same material as trim. Tub: White powder-coated cold rolled steel. 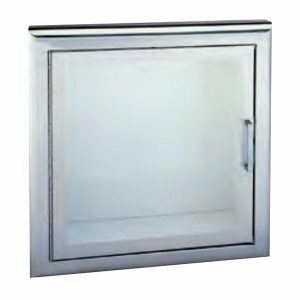 Surface-mounted stainless steel models feature a galvanized back panel. Knockouts (K.O.s) are provided centered, one, side, top and bottom—other side offset, top and bottom. Cabinets with 6″ depth will have K.O.’s centered. Trimless K.O.s centered only—no offset. 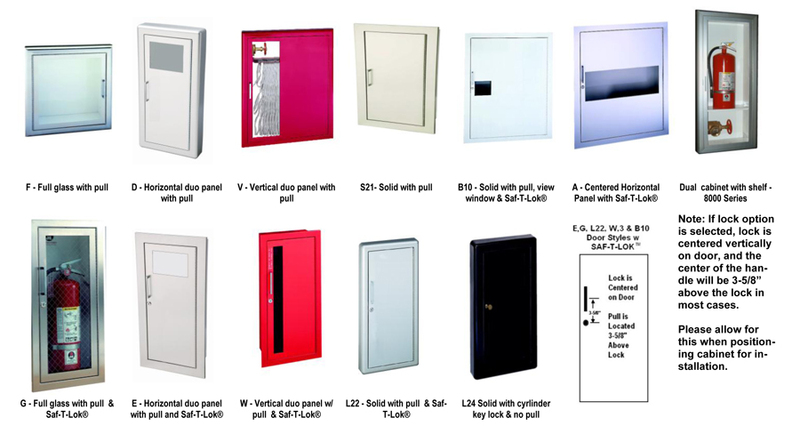 For suface-mount cabinets knockouts are provided only when exact location is known. See submittal for K.O. locations of each model. 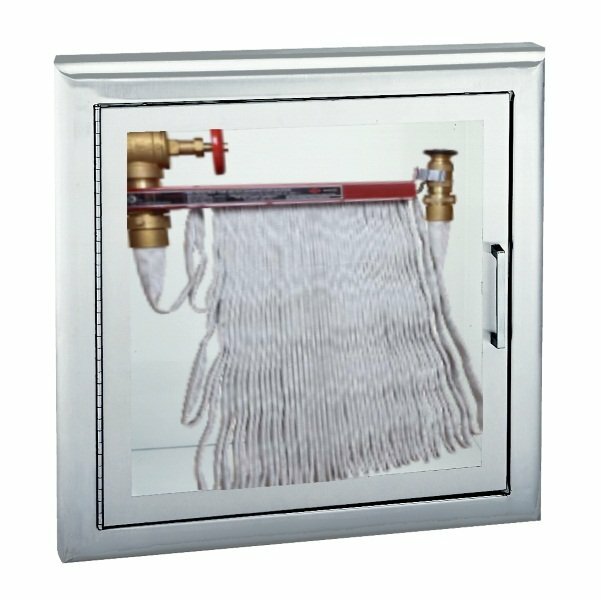 K.O.s are not provided on FIRE-FX2 cabinets or stainless tubs. Instructions for the knockouts in the field are provided and must be strictly adhered to maintain fire-rating.